The İstanbul concert will be preceded by an appearance on June 29 at the See-Rock Festival in Graz, Austria, and followed by a stadium gig on July 8 in the Bulgarian capital of Sofia, according to the website. The concerts will be part of the band’s “Up Close and Personal Tour,” which sees the band perform in several venues across the US in March. 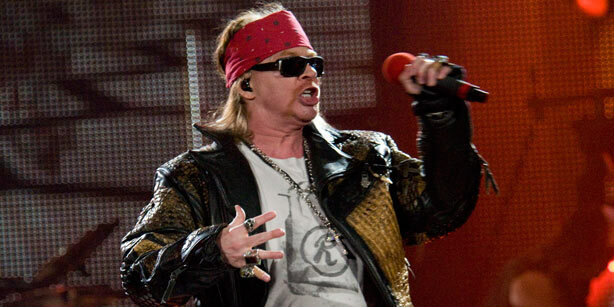 The band, formed in 1985 in Los Angeles, right now features only frontman Axl Rose from its original lineup. Best known for such hits as “Sweet Child O’ Mine,” “Welcome to the Jungle” and “Used to Love Her,” Guns N’ Roses will be inducted into the Rock and Roll Hall of Fame in April. Guns N’ Roses performed its first live gig in Turkey in 1993, a year when world-class acts including Madonna, Metallica and Bon Jovi, among others, made their first-ever Turkish appearances in unforgettable stadium gigs. The band also played İstanbul in July 2006.